A 40th birthday party magic event is something unique. 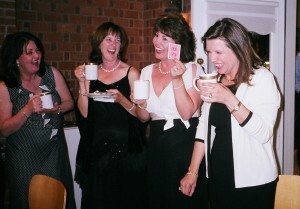 Entertainment that gets the group talking and interacting is perfect for this once in a lifetime occasion. In addition, unlike other forms of entertainment, magic allows for the Birthday Celebrator to be made the center of attention, as it should be. Patrick has performed at many of these special 40th birthday party magic occasions and knows just what can make the Party Person feel that everything is being done just for them on their special day. Patrick knows that yo u don’t have to embarrass to make it fun for all, especially the 40th birthday party person. Allowing them to direct and create the magic gets them into the center of attention and lets them come away with the empowered feeling that this is one of the best days ever. Milestone events, such as, a 40th Birthday Party, are important for the family and friends to let that individual know that they are meaningful to all the attendees. A gift of a memory of a special time can last much longer than a material thing and magic can make that memory happen. Wouldn’t it be fun and satisfying to have produce an event that not only pleases the 40th Birthday Party person, but also the friends and family that came to help celebrate the event?